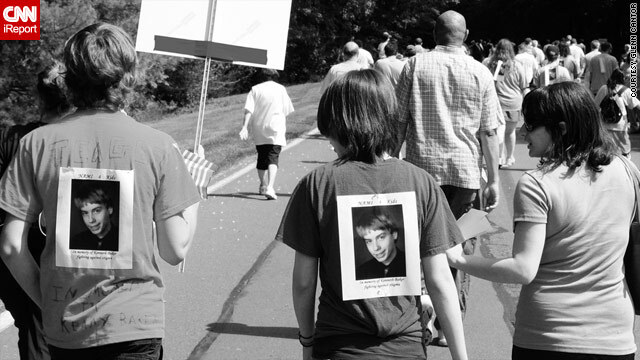 Walks to remember those who lost their lives to suicide are held nationwide. Here, friends remember Kenny Baker in May 2009. (CNN) -- When Lori Zeller lost her sister to suicide in 1991, she began a life of activism. At 22, Zeller started a support group in Chattanooga, Tennessee, for loved ones left behind after a suicide. She talked to friends and co-workers about suicide prevention and signed numerous petitions to pass legislation for insurance coverage of mental health services. But despite all her efforts, her brother took his own life 15 years later. "I believe in the importance of prevention," said Zeller, "but it was tragically ironic that even with all the knowledge I had gained ... we were still unable to save Dave." "That really made me angry for a while. Now, it just makes me frustrated and sad." Zeller was one of dozens of people who shared stories of losing loved ones to suicide on CNN.com's iReport. She is part of a growing movement of survivors of suicide loss who openly speak out about the experience despite the stigma attached. Although their stories are all different, the survivors have one striking thing in common: the way they talk about suicide. Rather than saying someone "committed suicide," they will say that a person "died of" or "lost to" suicide. "I was forever changed by these deaths, and have such empathy for anyone who must go through this," said Zeller. iReporter Liz Heydanek shares her story of loss so others don't feel as alone. Heydanek lost her husband to suicide 14 years ago. She and her three children still struggle to cope with his death. "Those who are left to pick up the pieces live in a very isolated place," said Heydanek. "No one knows what to do with us." Heydanek had a rough time after her husband's death. She suspected members of her husband's family blamed her for his suicide and had few friends to reach out to. Eventually, she sunk into a depression fueled by alcohol abuse. "It is a lonely place to be for the people who suffer," she added. It is a lonely place to be for the people who suffer. Heydanek said it was years until she learned about suicide support groups. She soon joined one and met other people who had lost loved ones to suicide. "Finding out that my kids and I were not alone was a relief. It didn't make our problems go away, but seeing that other people had survived gave me the inspiration to move on," she said. Today, the number of support groups around the country has grown significantly as compared with 10 or 20 years ago, said Bob Gebbia, executive director of the American Foundation of Suicide Prevention. "They certainly are much more common today. I think the amount of information online has changed that," he said. "We hear stories about survivors who didn't even talk about it in their families. Meeting other survivors is empowering -- it frees them to talk about this." On Saturday, the American Foundation of Suicide Prevention will host its 11th annual National Survivors of Suicide Day, a series of nationwide conferences to support healing and suicide prevention. In 1999, the organization hosted 10 conferences across the country, said Gebbia. Today, more than 230 simultaneous conferences are planned worldwide. Gebbia thinks the survivor movement has had a major impact on the growth of support groups. "More and more, I hear people saying 'I want to get involved and make sure this doesn't happen to other families,'" he said. The number of young people involved with suicide prevention also heartens Gebbia. He sees it as a sign that opinions are changing and the stigma of mental illnesses is changing. Kevin Camp, 29, is an example of that change. Camp discovered his family's history of mental illnesses after he sought treatment for bipolar disorder. His maternal grandfather suffered from the same disease but never shared his struggle with anyone. "He was of the generation of men so ashamed of it that it was a closely kept family secret," Camp said. But Camp, 29, talks candidly about mental illness. "I certainly do believe there's a stigma surrounding all mental illness," he said. "It has lessened from generation to generation ... my generation is more OK with openly talking about it than others." In 1998, one of Camp's friends died of suicide. "I don't often like to think about it because it reminds me how easily it could have been me," said Camp. Having struggled with suicidal thoughts, Camp said his friend's death was particularly haunting. "What kept going through my head when I heard about his death is how finite life is," he said. "I kept wondering to myself why I'd survived and he hadn't." Today, Camp rarely talks about his friend's death, but he does support open discussion about mental illnesses. "Any effort that seeks to destroy the stigma that keeps so many people in the dark, untreated and suffering silently, is well worth [it]," he said. Zeller said she talks about her siblings' suicides in hopes of helping others. She now focuses on suicide prevention among her family members. Both her brother and sister suffered from depression and paranoia. She is well-aware that mental illnesses may be biologically inherited. Zeller worries about her mother, remaining brother and the younger members of her family. "It is at the root of my anxiety," she said. Helping her family heal gives Zeller the motivation to carry on. "I want my children to know what survival looks like, what it means to finish the race, fight the fight and keep the faith." The American Foundation for Suicide Prevention offers online information if you or someone you know is contemplating suicide. For immediate assistance, contact the National Suicide Prevention Lifeline at 1-800-273-TALK (8255).